When it comes to delivering truly patient-centered care…how are providers supposed to know when they have “arrived”? 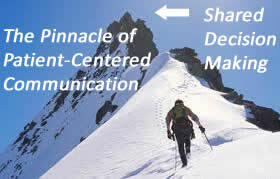 According to Michael Berry, MD, President of the Informed Medical Decisions Foundation, providers will know they have achieved the “pinnacle of patient-centered care” when they routinely engage their patients in shared decision-making (SDM). In theory, shared decision-making (aka collaborative decision-making) is what is supposed to happen between patients and their doctors when faced with a difficult choice. Clinicians engaging in shared decision-making would provide patients with information pertaining to the need for the treatment, the available options, as well as the benefits and risks. But patient-centered clinicians would also do something else. They would attempt to work with patients to arrive at a decision they could both live with. A kind of “shared mind” that takes into consideration their clinical perspective as well as the patient’s perspective – their preferences, needs, and values (which ideally have been captured over the course of the patient-provider relationship). A 2003 study surveyed U.S. physicians (N=1,217) preferences and actual practices regarding shared decision-making. Table 1 presents a summary of findings from this study. While most physicians in the study may philosophically believe in and prefer shared decision-making…as this data indicates that is not what most physicians in the study reported actually doing. In fact, 56% of physicians reported that they actually engaged in decision-making that was physician-dominated (with some patient involvement) or totally physician-dominated decision-making behavior (absent any patient involvement). The Barriers To Shared Decision Making? SDM is a great way to be engaging to patients – it is a way to get patients involved in their care in a meaningful way they can relate to. To be eligible to participate in Medicare’s Shared Savings Program, Accountable Care Organizations must implement processes to promote patient engagement, including shared decision-making. As readers of Mind the Gap know, I am a proponent of the adoption of patient-centered communication by providers, beginning with primary care. Shared decision-making has rightly been identified as a leading indicator when it comes to assessing the “patient-centeredness’ of a physician practice. So before you go around telling everyone how patient-centered your provider teams are first do a reality check. Because if you aren’t regularly engaging your patients in shared decision making you are not there yet. Street, R. et al The importance of communication in collaborative decision making: facilitating shared mind and the management of uncertainty. Journal of Evaluation in Clinical Practice 17 (2011) 579–584. I agree, shared decision making is the key to patient engagement. Nonetheless, I doubt shared decision making can be implemented or forced upon participants without prior education and value change. Research I conducted indicates most physicians enter their vocation, in part, because the profession offers opportunity for autonomy; a perception that is reinforced in medical school, as few medical schools teach communication skills, listening to patients or valuing their wishes. Patients, likewise, must make informed decisions if they are to benefit from shared decision making. They must be willing to accept responsibility, discipline themselves, and no longer expect physicians to offer “quick fixes” with drugs or unlimited costly tests. I feel alternative medicine, nutrition and exercise as well as psychological behavior change principles will need to be integrated into both the patient and the physicians view of medicine and what they value – autonomy, quick fixes, or individual responsibility, long term prevention and health benefits. Thanks for your comments. No doubt we are facing a whole bunch of “paradigm shifts” at the same time…involving both clinicians and patients. As you suggest, people, both providers and patients, are a product of their training. Physicians have been trained to be autonomous experts and patients have bee trained to assume the passive sick role. Yes training and eduction are needed…but I am convinced that there are some relatively easy quick fixes that leverage behavioral and communication theory capable of delivering some interesting results. As I travel my country (Canada) sharing results of a lit search initiative: ‘Client* Centered Care in the Community’ I’ve come to expect the question, from health care professionals of all stripes (who substitute for *client, the word person, patient, family) ‘ Does that mean the client gets what they want’. From patients (persons, clients, families) I get the same. This tells me there’s still lotsa work to do on the basics: interpretations of shared decision making and patient centered. And to this I say: upwards and onwards. Kathy, from my experience in the Michigan, where the majority of primary care providers are now designated as patient centered medical home providers, by one of the larger insurance plans, a patient-provider agreement is frequently used to define the partnership between the patient and the health care provider. This agreement encourages accountability of both individuals, working toward the agreed upon health care goals of the patient. It can and should be reviewed or referenced by either party, as necessary, should one feel the other is not meeting or fulfilling certain conditions of the partnership. I am not suggesting this resolves all patient-provider communication issues but, it has served as a helpful tool. Thanks for your comments. I see this is your first time leaving a comment. As part of signing the patient-provider agreement, I am sure you take the time to 1) educate each patient on their new role – which is no doubt very different than their traditional passive “sick role” …and 2) teach patients how to engage and communicate with their doctor (and vice versa) under these new roles you allude to. Right? As we worked toward meeting the various criteria of the PCMH model we learned a great deal along the way. We learned what worked well and what didn’t work so well. With the patient-provider agreement, we quickly learned that most patients were reluctant to actually sign an agreement, for a number of reasons. Some felt it was too formal, some didn’t understand the consequences and others wanted to maintain a passive role in their relationship with their health care provider. An educational brochure was then developed and used by the providers as a communication tool to help educate patients about the importance of a “partnership” and their active participation in the partnership. The tool prompted conversation between the provider and the patient as a means of education and engagement. I am sure in many circumstances, it was very easy to hand the brochure to the patient, tell them they have to be engaged, click a bullet in the EHR that conversation about the patient-provider agreement occurred and move on, with little positive impact for either party. I am aware however, in other circumstances, where the physician took the time to explain the importance and benefits of a partnership, patient engagement was enhanced and development of personalized care plans occurred. With a shift to a reimbursement model that accounts for the patient experience, I would think that healthcare providers will be more motivated to find ways to engage. Learning basic motivational interviewing techniques may provide a quick and efficient way for providers and patients to improve communication and outcomes. I hope you are correct. Remember the financial incentives, as I understand them, are limited to hospital-based/employed physicians. So whether we see an interest in improving the patient experience spread to the ambulatory setting is an open question. Hi Steve. You are correct regarding hospital based. My own belief is that this is part of a larger shift in the awareness that effective communication has on the patient/provider relationship. There is a great opportunity to improve the process. I know with the PCP shortage, time spent with patients is a huge problem. The docs are overworked and don’t have the time. Actually the research shows that physicians which effective patient-centered communication skills are more productive than their peers who practice the more common physician-directed style of patient communications. The time is there to be found. I am a doctor and run a Shared Decision Center. (medicaladvocate.com). I think that expecting a shared decision session in a specialist’s office is like expecting a BLT at a Chinese restaurant. It’s just not on the menu. It must be an independent process, conducted in a cool decision making atmosphere away from the pressure of the moment when the doc is standing above you like an Easter Island monolith. That is the future. Thanks for your comments. Unfortunately the evidence strongly suggests that the likelihood of a patient being engaged in shared decision making, whether by their personal primary care physician or a specialist, is the exception rather than the rule. On a personal note, the only time I experienced anything like shared decision making was in a retinal surgeons office while discussing options for repairing a torn retina. As the leader of our PCMH transformation and a Family Physician at Anchorage, Alaska’s Community Health Center, these are the elements of PCMH that are truly the most challenging to REALLY implement beyond face value. We provide primary care for all people, many of whom are uninsured, from a different culture/language and/or deal with psychosocial barriers that many can’t even imagine, so the time issues, when you add in the complexity and language are even more pronounced. HOWEVER, I would say that there’s nothing like NOT having available resource (money, insurance, or people having to pay cash) to inspire a conversation about the pros and cons of the options for ordering a lab, study or consult. Our providers do this because they “have” to, and it is a source of burn-out, because they don’t have the time, and they feel they are struggling against the broken system, but I can see that this is a piece of the puzzle. On the other hand, it’s harder to engage and have shared decision making/help patients set self management goals around behavioral change with patients; that’s where having a care team (nutrition, counselor, educator, trained nursing staff in Motivational Interviewing, whatever) would be of great value; problem is: in a fee for service world, those staff can’t pay their own way, and are in short supply. We’re still stuck in the middle.